The Cincy Chic Holiday Glam Fashion Show is this Friday (Dec. 7) at Lexus RiverCenter and there are only a few tickets left so make sure you RSVP! The event features complimentary drinks and fare, shopping, festive photobooth, and fashion show featuring “holiday glam” looks. Bring a gently used coat for St. Vincent de Paul and get a free swag bag! In that swag bag, we’ll have lots of goodies, product samples, and gift certificates. One of them that I’m super excited about is this Jeffrey Bartlett certificate. Jeffrey makes custom menswear (click here to check out a fashion show he did for Cincinnati Profile recently). The certificate is for 2 custom shirts for the price of one (I believe shirts range in price from $150 – $595). He said I could post the certificate for my blog readers in case some of you aren’t able to come to the event! So, here you go! What a great holiday gift idea for that well-dressed man in your life! Fashionistas, clear your calendar, find something fab to wear and get ready for a spectacular fashion show on the Purple People Bridge – all to benefit three local women’s health organizations! More info about the event is below (make sure you check out the tear-jerking video featuring three survivors)! Also, make sure you click here to enter yourself to win our Red, Pink and Blue prize pack valued at more than $2,500! A party and fashion show on the Purple People Bridge to benefit heart, breast and diabetes health. $10 per person, ticket includes access into event, and a front row seat along the runway, first 400 RSVPs get a swag bag filled with goodies! Sponsors Include: vitaminwater zero, Lexus RiverCenter, Performance Lexus, Mitchell’s Salon & Day Spa, St. Elizabeth Healthcare, Serket Jewelry, Widmer’s Dry Cleaners, The Garage, Pure Romance by Leslie, FENNOfashion, Keep It Tight Fitness, Miche Group, Three French Hens, Beauty Society, StormBennett.com, and Elements Event Centre. Media Sponsor: Locals on Living, an affiliate of the Cincinnati.Com network, and Yelp! 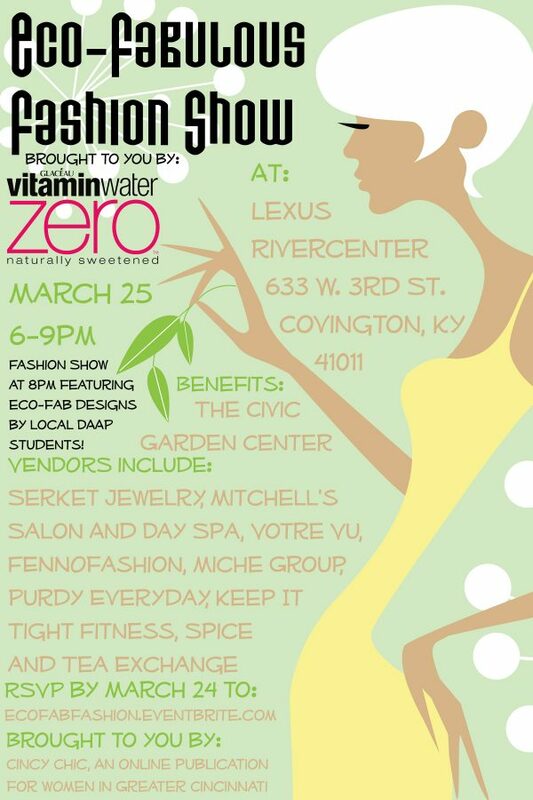 I’m so super excited for our “Eco-Fabulous Fashion Show” event coming up March 25! We did a go green event last year, and it was great. But this year, we’re taking it to a whole new, even more amazing, level. Last year, we had some designs that DAAP students made on display throughout the venue. It was neat to look at them, but none of them could really be worn. But this year, the DAAP students are making eco-fab designs that are going to be worn on the runway! The outfits will be made out of repurposed household items and/or eco-friendly products. Think couture gown out of dryer sheets whisking its way down the catwalk… yeah, amazing. Serket Jewelry is sponsoring the fashion show portion of the event, and is designing all the jewelry for the models. I interviewed her in this previous blog. I just love how innovative Lyn (owner/designer for Serket) is, so I’m sure she’ll have incredible designs and concepts for you to enjoy at this show. I’ll have a sneak peek here of some of her designs soon on the blog after Lyn and my fashion show intern go and check out the DAAP designs. Also, this year, Lexus has a brand new hybrid it’ll be featuring. AND vitaminwater zero just came on board as the presenting sponsor, so you know there will be great swag! Fashion Show at 8pm, showcasing eco-fabulous designs from several local DAAP students. Click here to RSVP by March 24! Event is free to attend. Those who purchase a $10 ticket will receive a swag bag and 100% of the proceeds will go to the Civic Garden Center. Drinks provided by Lexus Rivercenter. Food provided by Behle Street Cafe. Join us for the official after party at Behle Street Cafe. Complimentary parking in the rivercenter garage directly behind Behle Street Cafe. 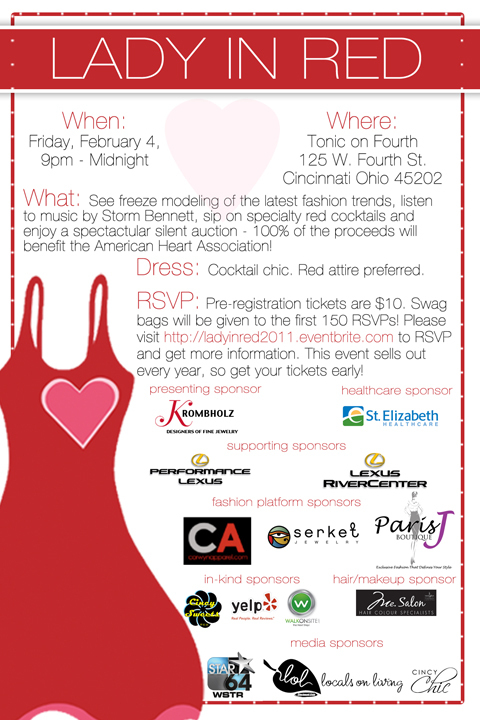 What: Swag bags for first 150 RSVPs, freeze modeling of the latest fashion trends, music by Storm Bennett, specialty red cocktails and a spectacular silent auction – 100% of the proceeds will benefit the American Heart Association! Dress: Cocktail chic… red attire preferred! Tickets: Pre-registration tickets are $10 per person. Swag bags will be given to the first 150 RSVPs! Click here to RSVP and get more information. This event sells out every year, so get your tickets early!